Administration of reimbursement - Coopsalute S.C.p.A. The system software for the management and validation of claims is the result of the experience gained in these years in the industry. Constantly tested and updated, the system makes it possible to adapt to the specific requirements, “guiding” the operator in the claims and eliminating the margin of error in calculating the limits of the health plan, optimizing operations and guaranteeing the expected timing of processing of claims. Transforming inbound calls to outbound, thus allowing to a call back service to the Member/Patient in the event of a queue, thus minimizing the waiting time and the non-response rates. 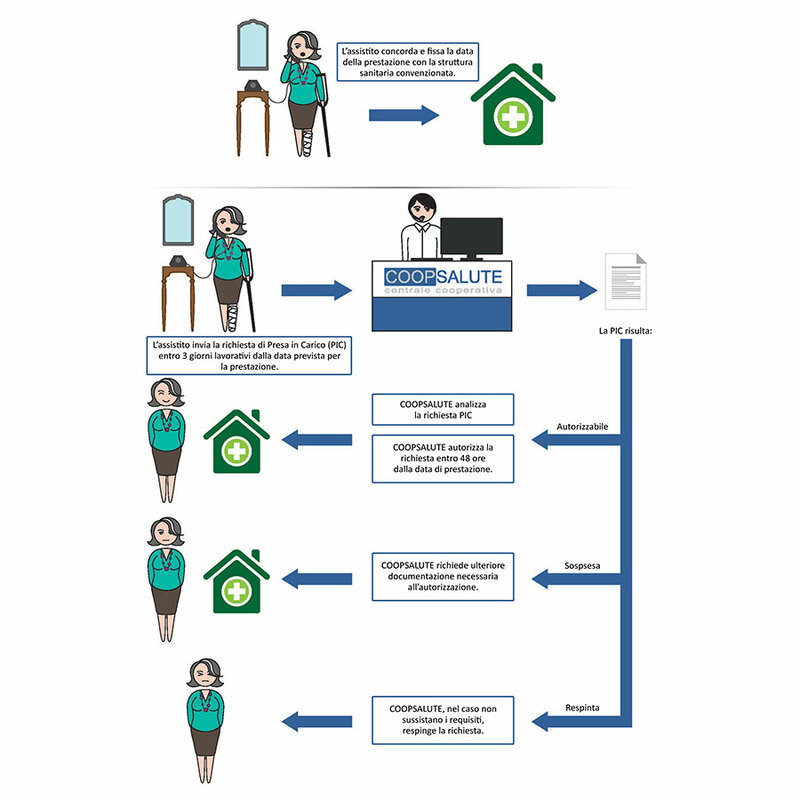 After receiving the care needed (even if not through the Network’s facilities), the Patient sends Coopsalute a Request for Refund form and all the documentation concerning the treatments performed (invoices, notes, receipts, medical referrals, requests, folder clinic, medical reports, etc.) to allow the assessment to the medical staff and offices in charge. If the conditions of coverage and procedures are met, the Patient may request the direct payment of the treatments to be made. The Patient must send the authorization application form accompanied by all the documentation relating to the treatment to be carried out to allow evaluation to the medical staff and to the offices in charge, at least 3 days before, in order to allow the necessary time for the processing of the request. If the conditions of coverage and procedural requirements are met, but the doctor chosen is not a member of the Network, the Patient may request direct payment of expenses related to the Health Facility and send, after reimbursement, the expenditure regarding the medical support for the same treatment. 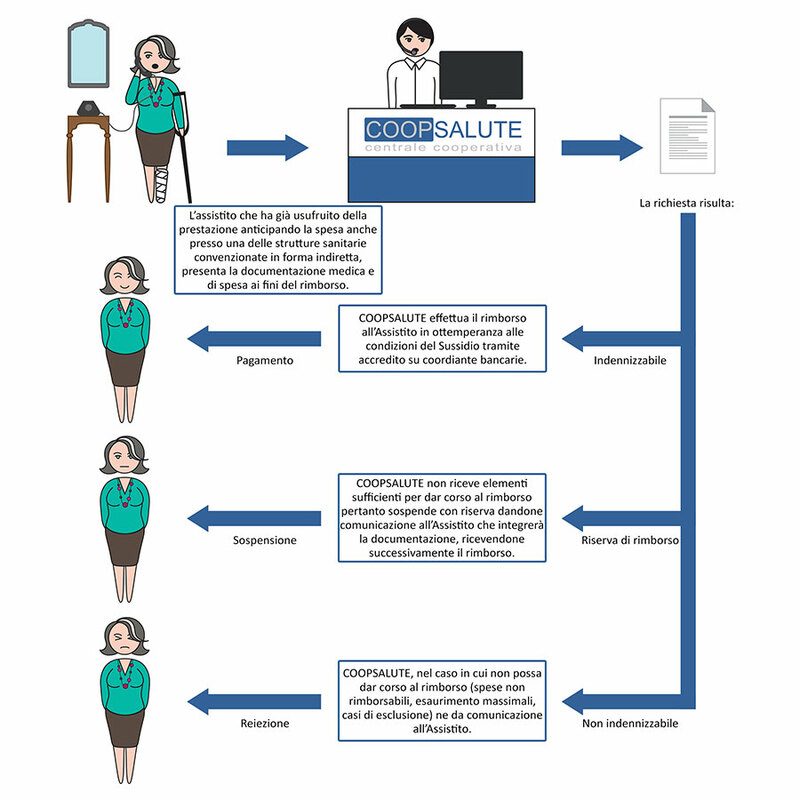 In the case of acceptance of the claim with direct payment, Coopsalute performs the procedures only and exclusively with a pre-activation system: each Patient – after having directly booked the service – sends to the Health Centre (Centrale Salute), normally at least 3 days before, the direct payment request, indicating the chosen healthcare facility and the doctor where possible. Only after having positively assessed the claim, the Health Centre will forward the authorization for direct payment to the Healthcare Facility, by sending the “REIMBURSEMENT” form via email. 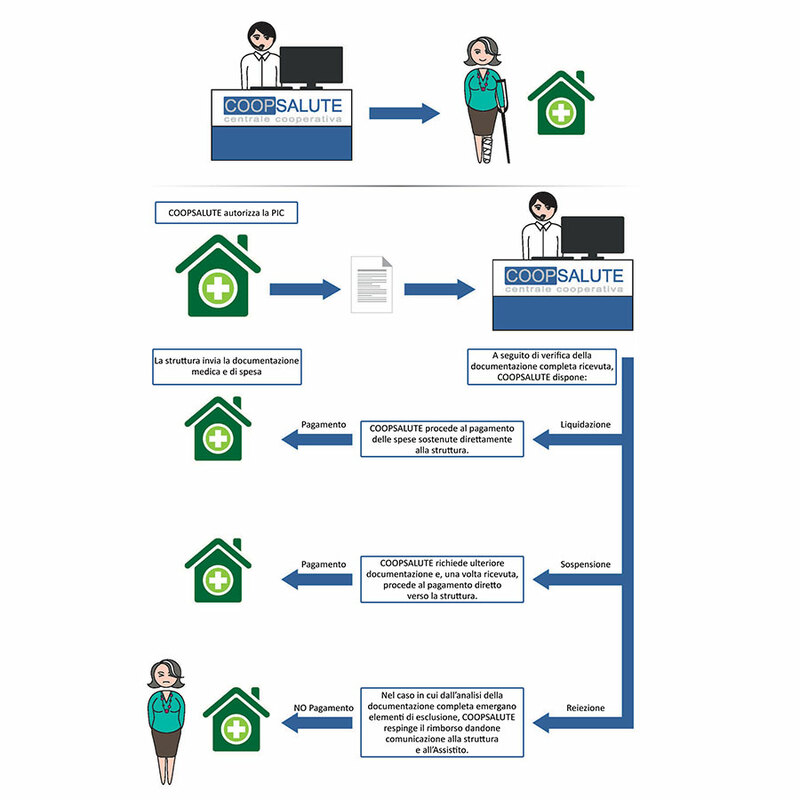 Once the reimbursement request is authorised by Coopsalute and treatment is provided, the Healthcare Facility will forward to Coopsalute all the required documentation concerning the treatments performed (invoices, notes, receipts, medical referrals, requests, folder clinic, medical reports, etc.) to allow the assessment to the medical staff and offices in charge. Once the claim is accepted, Coopsalute will reimburse the Healthcare Facility for the service. 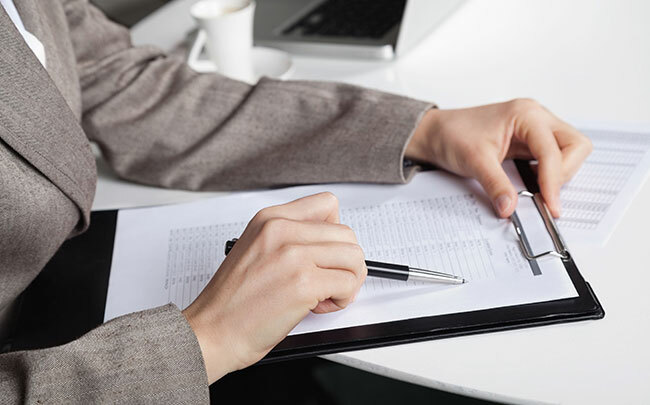 If the client has already benefited from the service by paying in advance, he or she can submit all the medical / health and tax documentation for reimbursement. If all documentation is provided correctly and no factors that may impede repayment are found, Coopsalute Payment Office will initiate reimbursement.